the class pauses untill July. I will be back soon then! Se libérer du conditionnement culturel qui est en discordance avec la manière dont je veux vivre ma vie, en repérant ce qui dans notre manière de penser et ou de communiquer, bloque et génère de l’inconfort voir de la violence. Avoir plus de clarté sur ce qui se passe en soi et plus précisément danssson corps, identifier les émotions et les besoins vivants dans le moment présent. S'exprimer, simplement et faire des demandes claires et réalistes. Apprendre à décoder des messages à première vue agressifs afind’augmenter nos chances de rétablir le dialogue. Développer une écoute empathique envers soi et les autres. Gurdjieff movements, also known as “sacred dances” are a powerful tool for inner and outer awareness. The practice makes it possible to become free of the automatism and habits of our body, emotions and mind. By moving differently than we usually do, we experience new qualities of energy and meet ourselves in new ways. Contemporary Dance, Traditional Chinese Medicine, Shiatsu, and Aquatic body work. Cycle Ride: Babies and children (plus parents and those young at heart!) are invited for a simple and short bicycle ride loop through Auroville in honor of Earth Day. Don’t forget your sun protection and water. Assemble in front of Solar Kitchen at 8:45am and start cycling by 9am. Hosted by: Aurovelo. Sunday Walk Farms and Forests: Visit Aranya Forest, departure at 5.30am from Solar Kitchen (see separate announcement in N&N/Auronet). Waste Pick Up: Start your Earth Day bright and early by beautifying our city! Join the AV Clean Up group for a litter pick up, starting at Certitude at 6am. Please be sure to bring sun protection and water. Hosted by: Auroville Clean Up Group. Theatre Performance: 'The Story of our Times' is a three-act play about alternative ways to make sense of the state of our world. One day a group of children asks various groups of adults some basic questions: "What's happening to the planet? How did we get here? Where are we heading?" The adults, some scientists, some business leaders, and some government officials respond from one of three perspectives: 1) Business as Usual, 2) The Great Unraveling and 3) The Great Turning. The play starts at 3 pm at the Pavilion of Tibetan Culture. Hosted by: R/Evolutionary Leadership programme. Presentation: Wild Otters Research is an organization based in Chorao island, Goa. Their current focus is on studying the ecology and adaptations of otters, while concurrently working on species of civets and porcupines, especially in South Asia. The aim of the research is to look at the holistic ecosystem and addressing issues such as data deficiencies for the concerned species, adaptations in human dominated landscapes and impacts therein. They also work to make research accessible to a wide specialised and unspecialised audience to better guide biodiversity decisions across the globe. They work with students and professionals both from academia and corporate streams to better undertake these missions by means of a variety of initiatives including offering short and long experiences, training programs, year long wildlife curriculum as well as research internships and volunteering opportunities. A presentation will be made about their projects by the director of the organisation, Katrina Fernandez, from 5-6pm in MMC Auditorium, followed by a Q&A session. If each of us actively forwards to 20 friends, requesting a small donation, we will see what we can come up with together. How to do it: Become Facebook friend of “Auroville Funding” https://www.facebook.com/Aurovillefunding and Auroville Funding Groups https://www.facebook.com/groups/177503702880787/. Share the recent 3 posts and videos in the coming days with your network, especially ecologists and people new to Auroville. On April 21st, 1 day before Earthday we will publish a crowdfundraising appeal on Facebook, and you share it, forward it actively. We will receive considerable matching grants on that day! (Only paypal and international money transfers) Make it appealing: Auroville is THE flagship of regenerative work, the biggest agglomeration of Earthcaring activities - in an international and Indian setting! Let’s fundraise for our green campus – online! Let’s work together to widen the network for land for Auroville. Over 40 Auroville initiatives work for ecology and human unity in the bioregion, but we urgently need to safeguard our “base camp”. Dear warm water and dance lovers, welcome to the closure of the season for Aquatic Bodywork courses and Dance Offering. In this event we combine our passion for warm water therapies, free dance movement exploration and contact improvisation. We will experiment moving on our own, floating each other, and moving as a group. As it is a build-up, it is essential that you are in the pool on time; latecomers will be welcome to enjoy the ocean instead . You need to pass at the reception latest between 3.30 - 3.45 and be changed by 3.55 in swimwear or clean shorts (we can not let you in the pool in the same clothes you arrive with). A life in the Wild - Presentation by Dr.Katrina Fernandez of Wild Otters Research, Goa. Dr.Katrina Fernandez is the head of research and director at Wild Otters Research, based in Goa, India. Her organisation works on a range of studies of different species of Otters and other wild animals and she herself has experience in working over three continents. She has a keen interest in education and how holistic knowledge systems can be built. You are invited to the talk to take a sneak peek into this elusive profession, challenges, collaboration opportunities and what exactly happens herein. She will be available for one on one discussions and questions after the talk. She will also be giving a presentation in TLC base camp on the 23rd at 10am for schools where she will discuss volunteer oppurtunities and internships. This is open to all students and teachers. And for those of you who miss the above two talks, there will be a third one at Anupama's house in Petite Ferme at 7pm on the 23rd. You can call me on how to get there - 9443263350. This film from the Sri Aurobindo Ashram covers the lives and work of Sri Aurobindo and the Mother from their childhood up to November 24, 1926. It shows the spiritual development and work of Sri Aurobindo and the Mother and the work they did for the new evolutionary step towards a Life-Divine for mankind and earth. They felt their mission from childhood onwards. We learn about Sri Aurobindo’s earlier spiritual experiences, his involvement in politics and the time in jail as well as his call to Pondicherry. We see the Mother’s specific spiritual development, her knowledge of occultism and her training, her time in Japan and the Mother’s final arrival in Pondicherry on April 24, 1920. 24th November 1926 is an important date in their work, the day of Victory, when the Overmind, Krishna descended into the physical body of Sri Aurobindo. After this Sri Aurobindo withdrew to devote himself to further more concentrated spiritual research, putting the Mother in charge of the Ashram. The film closes with a view of the united symbol of The Mother and Sri Aurobindo and some impressions of the growth of the Ashram. Duration: 100min. Theory music classes for all ages of music lovers and music students. Ear training, music notation writing, sight reading singing, composing etc. If you learn any music instrument you probably know basic music theory.But if you are still slow in music reading, solfedge, dont know how to compose music at all, you better work on your music theory skills and develop your music mind.Thats why I started Music theory classes in Cripa for kids and adults of all ages where we are singing, listening, writing, reading, learning music composition.In my country Theory of music is compulsary for all music students. In 1961 the Mother gave the adesh to Narad to bring down a new music. She said that one must go far above words and bring down the pure Music. Mother told us to sit in a circle and have no preconceptions as to what we would sing but to be silent and let the music descend in us. The OM Choir aspires to bring down the New Music for the New World in a collective body. We sing only OM, the creative and effectuating Word, after starting with warming-up and voice exercises given by Narad.
" A Body Prayer in a Tai- Chi Form "
Water in Auroville? Time to Act! Since its inauguration Auroville has been dependent upon one water resource alone: groundwater. While a fantastic effort has been made to optimize its recharge, the water table continues to deplete year after year. Auroville and the bioregion share the same groundwater. Over-extraction of this common resource by the neighborhood exceeds by far what Auroville is recharging. While we must reduce our water consumption through water saving, reuse, recycling, optimization, etc, even by reducing our water usage, we cannot anymore ensure water security through groundwater alone. It's time to change our strategy. Today's reality is that Auroville wells are getting dry, sea water intrusion is building up and we have no alternative in place. We are facing a water crisis! There are other sources of water which, combined, can guarantee Auroville's water security. It's time to leap forward! combination of movements from belly dance,yoga postures,breathing techniques,and free expression and exploration with the body. This is a closer look at Solitude farm through exploration of local food. This "Mini-Permaculture Workshop" will give you a clear insight on how to re-connect with Mother Nature through the principles of natural farming and permaculture. Includes harvesting and the secrets of our salads (mini-cooking workshop). Held every Wednesday, from 9:30 am to 12:30 pm, with lunch and refreshments at 12:30 pm. To sign up, please contact Krishna: call 984 331 2960, email krishnamckenzie@auroville.org.in, or come to Solitude Farm Cafe. Every Wednesday from 9.30 till 11 am! An invitation for pregnant women to experience the weightless, relaxing and connecting benefits of floating and movement in warm water. You are invited to come with or without your partner/birth-attendant. When you come for the first time, contact Friederike @9943247326 or Appie@8903158065 beforehand. We all have our Body’s unique way of Drawing! Come and find your own with Audrey. In the drawing workshop we explore abstract and figurative drawing. All materials are provided - Contribution for guests is Rs. 2,000/-, and for volunteers is Rs. 1,000/-. Aurovilians and newcomers are welcome to donate. Book in advance, workshops will be run only with a minimum of participants. Call Audrey on 0413 262 2641. Please leave your name and number slowly on the answering machine. After a successful pilot of the Human Library event in Auroville this March 2019, we are planning the next one for April ! We are grateful to all the Human books as well as the readers for manifesting this positive framework of conversations that can challenge stereotypes and prejudices through dialogue. 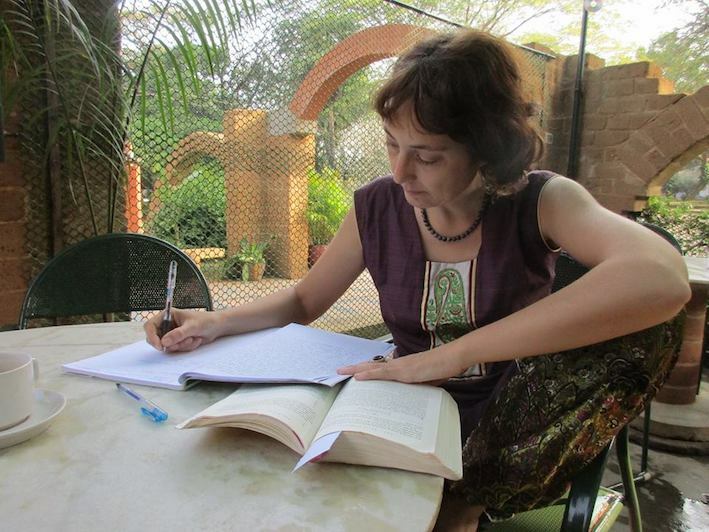 Auroville is an excellent library of diverse stories! We have received wonderful reviews and requests to have another event. We are happy to announce that we will hold another Human Library Event in Auroville on Friday 26th of April, 5:00-8:00PM at Humanscapes Hall. If you are curious about being a human book for the coming event, You can contact youthlink@auroville.org.in or Malcolm sumtinels@gmail.com, or you can make an appointment to pass by Humanscapes to know more about the Human Library event. We are also looking for sponsors and are open to collaborations as our event roughly costs around Rs. 2500 (FS #251048). Any additional donations for t-shirt printing would also be welcome. Thanking you for your participation, encouragement and support!